The Innocents (Les Innocentes) is a French-language film based on a true account from a tragic period in Polish history. Set in December 1945, it reminds us vividly of the Polish saying that it was Poland's lot to lose World War II twice - the first time to the Germans, the second to the Russians. Most of the film's action takes place in a Benedictine convent, somewhere in the Polish countryside. It opens beautifully with the nuns in choir chanting the ancient Advent hymn Conditor Alme Siderum, when all of a sudden we hear a scream, which turns out to be one of the sisters in labor. One of the young novices takes it upon herself to walk through the snowy countryside to town in search of a doctor who is neither Polish nor Russian. (This is not a movie about scenery, but the snowy wintry scenes are both beautiful and very effective in highlighting the sense of both isolation and danger that pervades the film throughout.) The young nun finds a young French doctor, Matilde, part of a Red Cross mission caring for French soldiers, who somewhat reluctantly drives to the convent. There she discovers not one but many pregnant nuns. The even more reluctant Mother Abbess finally tells Matilde the truth, how the nuns were repeatedly raped by a group of Russian soldiers - a fate Matilde herself only narrowly escapes on one of her nocturnal trips to and from the convent. The future for the nuns is bleak - not only because of their "scandal and disorder," but also because of the problematic situation which Poland (and particularly the Polish Church) now find themselves in, thanks to the Soviet occupation. That darkness is alleviated by the film's semi-happy ending, a "solution" to the "scandal and disorder" that almost borders on an artificial Deus ex machina. Not unlike another Polish film with a convent theme, Ida, which I posted about back in June 2014 (cf. http://rfrancocsp.blogspot.com/2014/06/ida.html), The Innocents fearlessly but sympathetically examines the dilemma of faith in a world which presents other options, which also purport, but with no greater success, to answer the challenges posed by the unsatisfying reality of life in our modern world. The Democrats made history this week with the nomination of the first woman candidate of a major party for president. Eight years ago, the Democrats made history by nominating the first non-white candidate for president. And 56 years ago, the Democrats nominated John F. Kennedy who went on to make history as our first Roman Catholic president. His election, the NY Daily News said at the time, dropped a hydrogen bomb on the tradition that no Roman Catholic could ever be elected president. Now no Catholic has been elected president since. But, for the past 8 years, we have had a Catholic vice president, and this year the Democrats have once again nominated a Catholic for vice president. Interestingly, while the Democrats were preparing to nominate another Catholic for vice president, the Republicans this year nominated an ex-Catholic. Indiana Governor Mike Pence was raised in a strong Irish-Catholic family, was an altar boy, and supposedly toyed with the idea of becoming a priest. But then he did what far too many other Catholics in this country have done and became an Evangelical Protestant. In fact, like Pence, some 6 million ex-Catholics (13% of those raised as Catholics) now consider themselves Evangelicals, according to a 2014 Pew survey. The point is not candidate Pence particularly, but the larger trend represented by those 6 million ex-Catholics. As Sherry Weddell, author of Forming intentional Disciples: The Path of Knowing and Following Jesus, recently wrote in the National Catholic Register, "God has no grandchildren" in the 21st century. "Faith is not simply inherited, but personally chosen." Hence, "cultural Catholicism by itself is dead as a retention strategy." Inadvertently, therefore, the two vice-presidential candidates highlight this significant dilemma that is confronting contemporary Catholicism. In its time, "cultural Catholicism" had a lot going for it. In fact, I think one of the long-term earthly goals of faith is to form and transform culture, and our contemporary failure to do that has been a genuine loss for the world - the world God loves enough to have become a part of it himself. But, as Sherry Weddell says, nowadays in our culture, "God has no grandchildren." What used to be passed down from generation to generation and absorbed from one's family and the surrounding community is no longer. Hence, the fundamental challenge facing the Church today to create committed, "intentional" disciples. Here again the vice-presidential contest is illustrative. Would Senator Tim Kaine speak so comfortably about his Catholic faith and about fe, familia, y trabajo, without the formational experiences he had under the auspices of the Jesuits, especially his missionary service in Honduras? Obviously, not everyone can go to Honduras. Not everyone is called to be a Jesuit Volunteer. But unless our ordinary local Church communities can incorporate comparably powerful formational experiences, it is hard to see how subsequent generations will be successfully drawn to the intentional commitments that seem to be the necessary successor to our lost cultural Catholicism. To compare the Republican party's convention in Cleveland last week and the Democratic party's convention in Philadelphia this week is almost like the proverbial comparison "between apples and oranges." Other than the fact that they were both party events, both designed to nominate candidates for the presidency, they might just as well have taken place in different countries. And in a certain sense they did. Despite some ostentatious opposition from the immature extreme left, the Democrats are way more united than the Republicans were. And it has really shown in the quality of the speakers and their consistent messaging, as well as in the audience in the hall, that has seemed for the most part to be actually happy to be there. There have been powerfully moving testimonies about important social issues such as the gun violence that continues to plague our society and powerful witness testimonials to the character of the presidential and vice-presidential candidates. Religious faith also has been much more on display - and much more naturally and convincingly - at this convention. And, unlike last week when so many political heavies stayed out of sight (or, in the case of Ted Cruz, tried to throw a monkey wrench into the process), the Democratic party's luminaries were largely all there and all spoke eloquently - most especially the President himself and his First Lady. And Bernie Sanders did what he needed to do - and in the process reminded everyone to pay attention to the issues that matter most and not to the inside-the-Beltway stuff that the media likes to focus on so much. And there was some serious effort to reach out to Independents and disaffected Republicans. Michael Bloomberg (a New Yorker who says he knows a con job when he sees one) made the pitch for the Independent vote. In the 1950s, President Eisenhower appealed to those he called "discerning Democrats." Now it was Mayor Bloomberg's turn to make the case for what might be called "discerning Republicans." Meanwhile, for the Democrats themselves, last night's final scene with the President hugging the woman nominated to succeed him spoke volumes about the party's unity and sense of its long-term purpose. After last week's strategy of running America down, the Democrats had the much more attractive task of highlighting the greatness of this country, why, for all its real problems and challenges, America remains in so many ways the envy of the world and that famous shining "city on a hill" Ronald Reagan used to like to invoke. It is now up to Hillary Clinton herself to tie it all together tonight, and to make the Democrats' case for how fundamentally transformative this election is going to be. The white-robed army of martyrs praises you! (Te martyrum candidatus laudat exercitus). So we pray in the great matutinal hymn Te Deum laudamus. Undoubtedly, Father Jacques Hamel, an 85 year-old French priest still serving a parish in the diocese of Rouen, Normandy, recited those words just yesterday on the feast of Saint James, the first of the apostles to be martyred. He prayed that hymn not knowing that the next day he would be murdered by a radicalized Muslim while celebrating Mass, and so might now already have joined that glorious white robed army of martyrs in their eternal hymn of praise. When encouraged by some to retire, he is supposed to have said, "I'll work until my last breath." And so he did - in a way he may never have anticipated!. Of course, the formal determination that someone has been killed out of hatred for the faith is made only by the Highest Authority in the Church as part of the formal process of beatification and canonization. For now, we may speak of Father Hamel as a martyr only analogously, in a non-technical sense. We may - must - speak of him as someone who has given his life as a witness (which is what the word "martyr" means literally) for Christ, killed as a consequence of that witness out of hatred for Christ and his holy Church. His act of witness was, of course, his public exercise of his priestly ministry, proclaiming the sanctifying mission of the Church to the world for the sake of the world As with the more famous historical cases of Blessed Oscar Romero (1917-1980) and Saint Thomas Becket (1118-1170), therefore, the very fact of being killed in Church while in the very act of celebrating Mass (or, in Becket's case, Vespers) cannot be ignored in assessing his killer's motivation. It creates a presumption of a religiously - as well as politically - motivated hatred on the part of the killers. Thus, the Postulator for Romero's Cause, Archbishop Vincenzo Paglia, himself highlighted the special significance of Romero's having been "killed on the altar." Let us pray, therefore, for Father Hamel's soul, entrusting him as we entrust all the departed to the mercy of God, praying also that through Father Hamel's intercession the Lord may graciously hear and answer our prayers for deliverance from our enemies and for peace and security for the Church and for our troubled world - and that in due time, if God so wills, we may invoke and venerate Father Hamel as a martyr for the faith and a protector and patron against terrorism. The passage we just heard [Genesis 18:20-32] from the Old Testament saga of Abraham takes us back some 4000 years to the heights overlooking the cities of Sodom and Gomorrah. Those cities now no longer exist, because (so the story tells us) of the outcry against them – so different were their citizens from Abraham. Though a recent immigrant himself, Abraham cared enough for the original native population that he was willing to plead with God to save them from destruction. Foreigner though he was, Abraham was certainly no tourist – a pilgrim perhaps in a land not yet his, but certainly no tourist. And his relationship with God was anything but commercial or transitory. Just before today’s account, God who (as we heard last Sunday) has just experienced Abraham’s generous hospitality, suddenly says he cannot hide from Abraham what he is about to do, because Abraham is destined to become a great nation, and all the nations of the earth shall be blessed in him [Genesis 18:17-18]. In this serious debate in which the fate of civilizations literally hung in the balance, we witness Abraham already at work anticipating that promised blessing for all the peoples of the earth. Abraham is sometimes compared to Noah, who (at least from what little we know) showed no apparent interest in his neighbors’ fate. Abraham, in contrast, cared not only for his nephew Lot and Lot’s family, who were then living in Sodom, but for the whole population of the doomed cities. For far too many of us, far too often, Noah’s narrow concern may seem normal. Expanding the boundaries that limit those we care about, whether those boundaries be national or racial or ethnic or religious or whatever – expanding them to include others who don’t necessarily look or talk or act like us – doesn’t happen automatically. It takes effort. Abraham, however, got it right – right from the beginning. In this he anticipated his greatest descendant, Jesus, who would intercede with his Father for the entire world. Sadly, in Sodom’s case, only three were saved from destruction. Whether Lot deserved to be saved is another question. He seems to have liked his settled and comfortable life in the prosperous city and lingered when the time came to leave. But, for Abraham’s sake, God got him out in time. We often don’t get what we deserve, and thanks be to God for that! The fate of those cities has never been forgotten. The prophet Ezekiel said they were proud, sated with food, complacent in their prosperity, and they gave no help to the poor and needy [Ezekiel 16:49]. How familiar does that sound? Jesus also used Sodom’s story as a warning. Whoever will not receive you or listen to your words – he said to his disciples – it will be more tolerable for the land of Sodom and Gomorrah on the day of judgment than for that town [Matthew 10:14-15]. In a sense, those corrupt cities stand for human civilization in its most advanced and successful state of development, complacently prosperous and comfortable and deserving of judgment – a salutary warning perhaps for other advanced and successful societies, like our own, and for us modern Lots who would likewise like to linger complacently in prosperity and comfort. But at the same time the story also suggests that for the sake of just a few innocent people God would have been willing to spare the cities. Unfortunately there were none to be found there. If we, undeserving though we are, hope for God’s mercy, that hope rests entirely in Abraham’s descendant Jesus, through whom all the peoples of the world have finally been blessed once and for all, and through whom all of us have been given a lesson in how to imitate Abraham in caring about even those who neither look nor talk nor act like us. In inviting us to call his Father our Father, Jesus enables us to enter into a special relationship with God similar to his own – sufficiently similar that we can confidently pray to God as frankly and freely as Abraham did and as Jesus still does. In the process, we may become more like Abraham and ultimately more like Jesus, who by becoming a blessing for us enables us to join our prayer to his and so become a blessing for all the peoples and nations of the world. Homily for the 17th Sunday in Ordinary Time, Church of Saint Anne, Walnut Creel, CA, July 24, 2016. Political Conventions tend to be somewhat rowdy and hyperbolic in their rhetoric. It should not surprise anyone, therefore, when convention speakers try to whip up enthusiasm by discrediting the leader of the other party. Sometimes the VP candidate does that as well. (Hubert Humphrey's magnificent "But not Senator Goldwater" acceptance speech in 1964 comes to mind.) But the presidential candidate usually leaves that to others and focuses more on a positive message. So what the relentless maligning of Hillary Clinton at this convention - including even in Donald Trump's acceptance speech itself - highlighted was how little positive there was to bind the party together. Hence, the reliance on malignant negativity. But the convention went well beyond ordinary negativity. As one right-wing pundit acknowledged in The Washington Post, the attempt to criminalize the opposition - especially the unprecedented and the malicious "lock her up" language - were more befitting a "banana republic" than the United States or any democratic constitutional state..Criminalizing the opposition and putting them in jail is what we expect from the likes of Vladimir Putin. It is not what is supposed to happen in America. But, of course, this has been a tried and true technique used by Republicans against the Clintons, notably used by the infamous Ken Starr in his unwarranted - and unsuccessful - impeachment effort in the1990s. While Ken Starr failed in his persecution of the Clintons, he succeeded in further deteriorating the character of our politicis and the civility of our society. Particularly striking is how this effort at partisan de-legitimizing has spread to other traditionally respected institutions. When Trump's campaign manager was challenged by a commentator who cited FBI statistics that the crime rate has been declining not increasing, the response he got was that the FBI is less trustworthy because the FBI Director (a Republican, by the way) was unwilling to propose prosecuting Hillary Clinton.Trying to de-legitimize even the FBI for purely partisan reasons reflects an even more radical breakdown in our common consensus and respect for our treasured national institutions. But most of what happens at conventions is inside the Beltway sort of stuff. It is the nominee's acceptance speech on the final night that likely gets the most attention from ordinary citizens. Whatever has transpired at the convention so far, it is the final night that may make or break a campaign. Trump's night got off to a good start. His daughter Ivanka introduced him with a quite serious and substantive speech - one which at times it sounded much more like that of a Democrat advocating gender equality in the workplace than that of a Republican. Then her father took the stage - and spoke for over 70 minutes! What the electorate does always like, however, is magical thinking, of which there was plenty in the speech, which promised to accomplish any number of almost miraculous improvements at home and abroad with no hint of any cost, while at the same time cutting taxes. Still it was the overwhelming negativity of Trump's vision of America that was so striking. Of course, the Republican party is particularly prone to conspiracy thinking. Still, if his audience really believed his dark picture of life in America, it is a wonder they were not terrified to go home last night! Likewise striking is just what a radical break this speech was (and Trump's candidacy is) from what the Republican party has long been about. One as to assume that many of the long-time Republicans in the audience have been long-time free-traders, who now must obediently change their tune and applaud as their nominee denounces the trade policies which previous Republican presidents and presidential candidates have so strongly supported. Of course, a very good case - or at least a very plausible case - can be made in support of Trump's (and Sanders') position on trade. But that is another issue. What is striking - startling almost - is what a very different Republican party was on display from what previous conventions have showcased. Gone for now - and maybe forever - is the party of Paul Ryan. Something similar could be said for Trump's encouragingly positive words in support of LGBT Americans. Those words may have come easily to the cosmopolitan Trump, a New Yorker after all, with what Ted Cruz famously called "New York values." But one has to wonder how easily the applause came for some of the delegates, who nonetheless again obediently fell into line. And, in that whole lengthy address, there was not even one word about abortion. Trump's rhetoric on trade and immigration may remind one of Pat Buchanan, but the decades-old "culture war" seems really to be over - at least as far as Trump is concerned. In 1964, the leader of the extreme right wing of the Republican party, Senator Barry Goldwater, won the presidential nomination at that year's Republican convention. He (and his party) lost in a monumental landslide. But, four years later, the country elected a Republican president anyway (albeit a moderate centrist, Richard Nixon). By 1980 the right wing had both regained control of the party and put one of its own in the White House. Soon the moderate centrists were gone, and the Republican party was a much more ideologically right-wing institution. The Democrats went through something similar over the same period. In 1972, the leader of the party's left wing, Senator George McGovern, won the presidential nomination andthen lost in a monumental landslide. The next two Democratic presidents (Carter and Clinton) represented the more moderate centrist wings of the party. But the trend was inexorable, and soon most of the moderate centrists were also gone, and the Democratic party has become a much more ideologically coherent left-wing institution than it had ever been before. Conventions don't matter as much (in terms of securing the nomination) as they did in 1964 or 1972. But they still serve as symbolic turning points in a party's identity. For decades, the Republican party's ideology has been about increasing the wealth of the already rich, top sliver of the population. But, to appeal to a sufficiently broader constituency to win elections, it has moved in a rightward direction on a host of social-cultural issues. This began with Goldwater's vote against the 1964 Civil Rights Act, positioning the (Republican) party of Lincoln to trade places with the (Democratic) party of the Old Confederacy as the vehicle for white racial politics. That appeal became more explicit with Nixon's "Southern Strategy" (more an electoral than governing strategy, since Nixon for the most part governed moderately). As the country has become more polarized, the process has accelerated. The Republican elite has doubled down on its tax-cuts-for-the-rich ideology, while continuing to address non-rich voters with social and cultural - racist, xenophobic, misogynistic, and homophobic - appeals. The elite tail kept wagging the populist dog until Donald Trump unexpectedly administered a monumental defeat to the establishment in this year's primary process, a turning point in the party's history which will be ratified formally at the Cleveland Convention this week. An establishment which had long winked at its base's de-legitimizing of the country's first non-white president has now been largely de-legitimized itself. Political predictions are a risky enterprise. Human factors will always interfere with political science models. Still it seems reasonable to suppose that, if Trump wins the presidency, the Republican party will no longer predominantly present its elite, neo-liberal, economic conservative face to the world and will become more of a white nationalist party, similar in some respects to some contemporary European versions. If Trump loses the election, there will be more of an opportunity for the establishment to fight to regain control of the party from its more populist base. But, if the lessons of 1964 and 1972 hold, the transformation wrought this year by the party's grass roots may prove inexorable and irrevocable. Meanwhile, the Democratic party has also been going through its own internal identity conflicts, all of which would have been much bigger news this year had it not been for the Trump phenomenon among the Republicans. The Democrats are nowhere near so internally divided as the Republicans. They also lack the same extreme allergy to the responsibilities of governance and so have more of a positive program to offer their base. And they have the country's changing demographics largely on their side. So their internal stresses and prospects for fractures are much less explosive. Still, when the dust has settled from this election, the Democrats will likely also continue to struggle among themselves over the soul of their party with by no means easily predictable results. Oh for the good old days (not that long ago actually) when the choice of the vice-presidential candidate was a hasty decision arrived at usually on the last day of the party's convention! The first one I can remember well was JFK's somewhat surprising choice of LBJ the night Kennedy was actually nominated. While Kennedy had arrived in Los Angeles as the frontrunner, it wasn't until the actual roll call of the states that he secured the nomination for certain. That night, after the roll call and Kennedy's unprecedented visit to the convention, he and his advisers settled on the choice of running mate. It was a surprise to many at the time and was controversial among some more liberal elements in the party (who had already had to swallow Kennedy for president, a less liberal candidate than some others), In retrospect, of course, it was an obvious choice and was probably crucial to Kennedy's winning the election - one of the few times the VP candidate really made that much of a difference. Four years later, President Lyndon Johnson used the choice of his running mate to create the only real suspense at the Atlantic City convention. He too made an impromptu appearance the night of the roll call to announce his choice of Hubert Humphrey, who was duly nominated the next day. Then there was the catastrophic 1972 convention, After McGovern had successfully won the nomination, he selected Senator Thomas Eagleton as his running mate. but that was the year the left wing of the party had completely taken over the convention, and so the country was treated to a shamefully narcissistic spectacle of delegates nominating all sorts of frivolous VP candidates just to make their point, with the result that by the time Mcgovern got to make his acceptance speech it was the middle of the night and much of his audience had already gone to bed. I was at a party that night at which we were supposed to have steak at the moment Mcgovern stepped up to the rostrum. We stuck to the schedule, even though that meant having the main course much later int he night than anyone had anticipated! It was Ronald Reagan who created the new custom of announcing a running mate before the convention, when he did so in 1976 in an unsuccessful attempt to help his candidacy against incumbent President Ford. Since then, however, as the nomination has increasingly been secured somewhat well before the convention, candidates have added excitement to the runup to the convention by making a big show out of introducing their candidates in advance. Of course, it is a good thing if candidates take more time than they used to in making this choice. In the last 100 years, three vice presidents have succeeded to the presidency on the death of the president. (A fourth, Gerald Ford, likewise succeeded when Nixon resigned, but Ford had not been nominated at a convention or elected as a running mate.) All too often, however, the VP choice has become yet another media-driven circus. Some running mates of excellent quality have been picked in recent elections (e.g., Al Gore, Joe Biden) but the increased interest in the VP spot has also resulted in disastrous choices designed mainly to make a media splash most obviously McCain's choice of Sarah Palin in 2008. It is unlikely that either candidate's choice of running mate will swing this election, an election in which the electorate already has strong impression of and opinions about the candidates at the top of the ticket. So the media-generated interest in the selection is largely that - a media phenomenon. It sounded downright comic to me yesterday when the news switched from the UK's getting a new prime minister to the gossip about Trump's and Clinton's possible running mates - as if the two were comparable choices. Historically, most candidates might have done just as well or better without a running mate. The whole process is a reminder of what a peculiar contrivance the office of Vice President really is in our system - something the very first holder of that office, John Adams, so very famously noted when he complained to his wife Abigail, "My country has in its wisdom contrived for me the most insignificant office that ever the invention of man contrived or his imagination conceived." Today, on the anniversary of his death, the Church commemorates Emperor Saint Henry II (973-1024), of whom the Church's prayer says that he was raised in a wonderful way from the cares of earthly rule to heavenly realms. Henry was a member of the Bavarian branch of the Ottonian dynasty, the family that held the Holy Roman imperial crown beginning with Emperor Otto I in 962. As a boy, Henry received a strongly religious education. He succeeded his father of Duke of Bavaria in 1995. He got himself crowned German king (Rex Romanorum) in 1002 and king of Italy in 1004. He supported Pope Benedict VIII in his conflict with an anti-pope and so was crowned Holy Roman Emperor in Saint Peter's on February 14, 1014. Henry was successful not only in consolidating his own position but in centralizing authority in the Empire. But, unlike the empire's contemporary reincarnation in the form of the European Union, he built much of that authority on his personal and political relationship with the Church. He is said to have commanded the Abbot of Verdun to accept him as a monk in his monastery, whereupon, so the story goes, the Abbot then commanded him as an obedient monk to continue ruling his empire. (A Benedictine Oblate in life, Henry became the patron saint of Oblates.) His queen-empress, Cunegunde of Luxembourg, was also very devout and after Henry's death retired to a monastery Henry had founded. Henry was canonized by Pope Eugenius III in 1147, and Cunegunde was canonized by Pope Innocent III in 1200. So they are among the handful of the Church's canonized couples. In addition to serving as a model of a statesman who was also pious and devoted to the Church, Henry might well serve as a patron of a type of European integration that was rooted in Europe's Christian soul - a soul that it seems has been sold off in modern Europe. Sunset Song is a British film adaptation of Lewis Grassic Gibbon's 1932 novel of that name, set in a fictional location in northeastern Scotland in the early years of the 20th century. I had never read Gibbon's novel, nor ever even heard of it before. So all I knew about the movie going in was that it was a well-regarded, beautiful-to-look-at, but also sad story of family life. And so it is, as natural beauty is constantly contrasted with the seemingly unending cycle of human suffering imposed by a combination of generations of poverty and the then conventional norms of family life, rural social life, and (later in the story) political loyalty. The sorrowful central character is a young girl, Chris Guthrie, who is simultaneously deeply attached to the rural land where she lives but is also smart enough to aspire to an opportunity to study to become a teacher. That never happens, however, and she remains stuck on the farm with her unhappy family, ruled by a hateful, tyrannical father. But the two sides of her personality continue to coexist, and she will end up tht much the stronger for it. Her father is a hateful tyrant, who keeps getting his wife pregnant until that drives her to kill herself. The younger children go to live with an aunt, and Chris's adult brother leaves for the city (and eventually marries and emigrates to Argentina). That leaves her alone to care for her demanding, oppressive father and the farm, until he finally has a stroke and dies. The natural beauty of the land notwithstanding, the life is hard at best. It is a relatively isolated existence (mitigated by some scenes of social life). And the mind-numbing, soul-destroying struggle to extract a meager living from the land recalls what Karl Marx famously called "the idiocy of rural life." For all the film's evocation of natural rural beauty, it does not romanticize that difficult struggle or that hard way of life. With Chris's sudden liberation from her father's tyranny, however, the story gets happier for a while. Able to make do on her own with her inheritance, Chris falls in a love with a gentle , sensitive neighbor who seems smitten with her. They have a simple but beautiful New Year's Eve wedding and soon have a son. But this idyllic interlude is ruined when World War I comes and her husband feels pressured by public opinion (and their local Kirk) to enlist. Sadly, the war damages him and their relationship, and the story ends with him dead and her alone again. The filming takes the desire for authenticity perhaps a bit too far. It is hard to follow the difficult Scottish dialect (even with the assistance of subtitles!) And like the language, the pace of the film tediously reflects more the pace of that way of life than our contemporary lifestyle. That pace puts us more in touch with that long-lost way of life and its straightforward simplicity, which one is led to appreciate and respect. But the hard work, the somber, Church-of-Scotland severity that envelopes so much of that life, and the exploitative oppressiveness of family relationships all also make one much less likely to lament the loss of that centuries-old way of life. Even so, the story subtly exposes how trapped all of the characters are both by their poverty but also by the stultifying emotional demands that grim way of life imposed on them, and invites us to empathize with them all. When war comes with the "antichrist" Kaiser, God's "wisdom and anger" are invoked. But God himself seems singularly absent from the wretchedness of this very fallen world, so very much in need of redemption. What perhaps everyone might have benefitted more from might have been a very different kind of message formed in a different image of God. Way back when, during my fairly brief sojourn as an academic, I once wrote a paper for presentation at a conference, in which I looked at how Saint Thomas More's Utopia transformed classical political philosophy by incorporating the very unclassical ideal of monastic poverty. That enabled More to oppose the modern emancipation of acquisitive economic impulses and reaffirm traditional political theory's subordination of economics to politics, but to do so in a way which avoided classical culture's problematic exclusion of working people and their labor from political participation. I was reminded of that long ago and far away academic exercise today on this feast of Saint Benedict (480-547), the author of the monastic rule that bears his name, the Patriarch of Western Monasticism, and (since 1964) patron saint of Europe. At a time of virtually complete political and social collapse, Saint Benedict left the ancient imperial capital (by then reduced to a mere shell of its ancient glory and grandeur) and founded an alternative community of committed people devoted to pray and work together. It was these communities of "Benedictine" monks who largely kept Christian faith and humane culture going in the West, eventually laying the groundwork for their flourishing in a revitalized Catholic Europe. Roman Catholic religious life in a particular way and Western civilization in general owe so much to Saint Benedict's legacy. when men and women of good will turned aside from the task of shoring up the Roman imperium and ceased to identify the continuation of civility and moral community with the maintenance of that imperium. What they set themselves to achieve instead—often not recognising fully what they were doing—was the construction of new forms of community within which the moral life could be sustained so that both morality and civility might survive the coming ages of barbarism and darkness. If my account of our moral condition is correct [one characterized by moral incoherence and unsettlable moral disputes in the modern world], we ought to conclude that for some time now we too have reached that turning point. What matters at this stage is the construction of local forms of community within which civility and the intellectual and moral life can be sustained through the new dark ages which are already upon us. And if the tradition of the virtues was able to survive the horrors of the last dark ages, we are not entirely without grounds for hope. This time however the barbarians are not waiting beyond the frontiers; they have already been governing us for quite some time. And it is our lack of consciousness of this that constitutes part of our predicament. We are waiting not for a Godot, but for another—doubtless very different—St. Benedict. In contemporary "conservative" circles, this is often popularly referred to as the "Benedict Option," which is especially associated with The American Conservative's Ron Dreher. This "Benedict Option" may be interpreted in many ways, but it is most coherently and plausibly, I believe, understood less as a literal "flight from the world" and more as a recalibration of one's relationships with worldly institutions - less a political struggle ("culture war") to enforce the now-lost norms of Christendom in a contemporary political culture where the older moral consensus has been destroyed, and more as an in-depth renewal of faith and culture on a community level. The center has not held in American life, so we must instead find our centers for ourselves as communities of like-minded citizens, and then build out the American ethic from there….Those seeking to reach Americans with an unfamiliar moral message must find them where they are, and … must make their case not by placing themselves at the center of society, as large institutions, but by dispersing themselves to the peripheries as small outposts. Far from being an historical curiosity, the accomplishments and legacy of the real Saint Benedict remain a promising avenue for further reflection on how to retrieve the best of what so much of our secular culture is in such a headlong rush to abandon. There really are few things more exasperating than asking a serious question and not getting a serious answer – whether it’s an evasive answer that one gets, or maybe no answer at all, or (perhaps worst of all) another question instead of an answer. If the lawyer in today’s gospel was at all like most of us, I think he must have been very exasperated with Jesus! Of course, the lawyer was able to answer Jesus because he had been properly instructed in the Jewish law and so could quote it correctly. Jesus accepted his answer, but the lawyer demanded further clarification. What he said, in effect, was, “The law says I am supposed to love my neighbor as myself. OK, then just who exactly counts as my neighbor? A good question, an important question, as so many recent events in our fractured society keep reminding us! We’ve all already heard it so many times that we all already know the story. And, because we already know the story, we’re not at all surprised when (of all people) a Samaritan appears as the hero. So we can call it the “Parable of the Good Samaritan,” conveniently forgetting what a complete contradiction in terms that phrase, “Good Samaritan,” would have been to the people who first heard this story from Jesus himself! Of course, our only experience of Samaritans is this story (and others like it). We certainly haven’t experienced Samaritans as unwelcome, threatening, and despised foreigners the way the lawyer (and the rest of those present) would have experienced them. So we completely miss the surprise, the shock, the real scandal in the story – and so also miss the point, which is the parable’s invitation to us to think about things in a new way. Jesus never answered the lawyer’s original question. He let the lawyer do that himself. We don’t need Jesus just to quote the Old Testament law commanding us to love God and to love our neighbor. We can do that ourselves. But we do need Jesus to make the commandment come alive in our world. We need him to tell us who is our neighbor. But, if we hear this story from the viewpoint of the man who fell victim to robbers, then that will hardly be our question. Jesus’ story subtly shifts the focus from neighbor as an object of obligation, to neighbor as someone who acts, someone who intervenes and saves, who acts on my behalf and comes close enough to touch me and become my friend. Now, as everyone in Jesus’ audience would presumably have understood, in an ordinary world both the priest and the Levite would have had very legitimate reasons, when they passed by, to stay on the opposite side. To do their jobs, they had to remain ritually pure, which precluded contact with corpses (a real danger here, since the victim, so we’re told, was left half-dead). The Samaritan, on the other hand, was an outsider - even as so many of us are today to one another. The only thing he had to lose by getting involved was his right to remain aloof. Jesus’ parable portrays otherwise ordinary people in an otherwise ordinary world and one person, a Samaritan, for whom nothing is ordinary anymore. It gives us a glimpse of how God acts – as seen in the actions of Jesus. The question for us is whether we want to enter that new world. The “Parable of the Good Samaritan” is really a story about Jesus, whose whole story is about the neighborliness of God, the distant stranger who has now become our friend. To ask, like the lawyer, what my minimum moral duty is, that suggests that the moral life is a burdensome obligation – that being in society with others is a burden. That may be the ordinary logic of our ordinary world. But the God who is no longer a stranger to us, because he has become our neighbor, has given us – in Jesus – a glimpse of God’s logic and God’s world. Homily for the 15th Sunday in Ordinary Time, Immaculate Conception Church, Knoxville, TN, July 10, 2016. "People, look east. The time is near." People Look East is an Advent hymn, composed in 1928. It is definitely not one of my favorites. A priest friend of mine once called it "the Christmas Decorating Song" because of some of its more silly lyrics. But, like it or not, its opening line just naturally came to mind as I reflected on a recent speech by Robert Cardinal Sarah, Prefect of the Congregation for Divine Worship, and the widespread chatter that has ensued as a result of that speech. The Cardinal spoke at a liturgical conference in London. He quoted Pope Francis' 2014 statement that "there remains much to be done for a correct and complete assimilation" of Vatican II's 1963 Constitution on the Sacred Liturgy. He highlighted what is obvious from any fair reading of the liturgical Constitution - that the Council Fathers intended a reform (not a radical replacement) of the Roman liturgy they knew. Thus, Cardinal Sarah suggested "the possibility of an official reform of the liturgical reform." The possible reform that has gotten the most immediate attention, however, was his appeal for a prompt return "to a common orientation of priest and people." I rather doubt any immediate widespread change is around the corner or that most people's experience of Mass is likely to change ay time soon. But the debate about orientation has been an ongoing one and in some circles an impassioned one, and so deserves more serious discussion. The other thing to be gotten out of the way when talking about ad orientem celebration today is that the term no longer really refers to geography. We may regularly refer to the altar and apse area as the liturgical "East," the main entrance as the "West Door," and the traditional site for the Baptistery as the liturgical "Northwest," but in fact they are often not that at all. In the parish church I grew up in and in the three parish churches I served at in Toronto and New York, the church building actually faced west, while my current church in Knoxville more or less faces south. Better than referring to points of the compass, it would be better, I believe, to speak about priest and people facing the same way versus priest and people facing each other! Because that is what this really comes down to - not an archaic debate about the geographical orientation of the church building. Once we think of the matter in those terms, then the real issue becomes clear. Should we all pray together facing the same direction? Or should we face each other? Stipulating that both those ways of celebrating Mass are equally legitimate and may both be beneficial, there is much to recommend the approach that we should all pray together facing the same direction during the Liturgy of the Eucharist. (The Liturgy of the Word, which in the current rite is celebrated away from the altar, is a totally separate matter.) 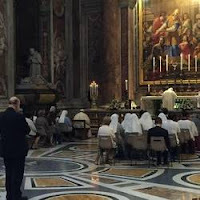 Of course, in my almost 21 years of priesthood, I have only on the rarest occasions celebrated Mass at a "traditional" altar, usually when celebrating Mass in some chapel while on pilgrimage abroad. Concelebrants often find themselves standing behind the principal celebrant and so experience the unity of praying in the same direction with him, while he typically faces the congregation. For all practical purposes, almost all my experience as a celebrant has been versus populum, although of course I can well remember attending (and serving) Mass ad orientem as a child. My main concern, however, is not nostalgia, nor is it tradition per se (since, after all, both forms are "traditional"). My concern rather is that, since versus populum celebration became popular in the mid-1960s, it has coincided with (and may have been itself a major contributor to) a greater emphasis on the person of the priest and a focus on his subjective personality. Even the celebrant who tries very hard to submerge his personality in the liturgy and not attract attention to himself cannot completely avoid the subjectifying effect of the Eucharistic liturgy at least looking like a dialogue between priest and people rather than a prayer offered by the entire congregation together under the leadership of the priest. In the old rite, even when the Pope celebrated Mass versus populum in Saint Peter's, the psychology of the experience was very different. The Pope celebrated Mass at a great distance from most of the congregation and at an altar on which stood a large crucifix and 7 tall candles, plus 2 large reliquaries. (See, for example, the YouTube videos of the Coronation of Pope Saint John XXIII in 1958.) So even there the sensibility was traditional and not what it has since become. The Paul VI Novus Ordo Mass has many beneficial innovations. De facto, celebration versus populum has come to be seen by many as one of those. But not only was celebration versus populum never even hinted at in Vatican II's Liturgy Constitution, it is obviously unnecessary for the reverent celebration of the new rite and may itself be an obstacle to further reverent reform. Certainly Anglicans (and Lutherans) have celebrated a vernacular liturgy for centuries and done so ad orientem without experiencing that as any kind of obstacle to congregational understanding and participation! Perhaps the most sensible solution in the present circumstances would be to provide more opportunities for more people to experience both directions of celebration on a more regular basis. Over time, experience will sort things out; and, if that results in one or other form predominating, so be it! Much as I like and admire Alexander Hamilton, I have never actually agreed with him that democracy is "the most ignoble, unjust and detestable form of government." Rather, I am more inclined (in this as in so many other matters) to align my thinking with Aristotle, for whom democracy was merely the least bad form. The problem, of course, is that in actual politics what are in theory the more ideal forms of government - monarch and aristocracy - easily deteriorate into the evils of tyranny (for Aristotle, the worst form) and oligarchy. The framers of the American constitution - in the tradition of Aristotle and Polybius - attempted to establish a republican "mixed constitution," which, by combining the best aspects of monarchy, aristocracy, and democracy, would avoid the worst elements of democracy, oligarchy, and tyranny. As is suggested by Benjamin Franklin's often quoted response to the question of what kind of government the constitution had created - "a republic if you can keep it" - maintaining such a republican "mixed constitution" is an ongoing challenge. That is eminently obvious today, when civil society seems so much less like a classical republic and more recognizable as an oligarchy. This has been increasingly the case since the destruction of the solidarity-promoting New Deal, post-war consensus in the 1960s and 1970s and the triumph of oligarchy-promoting market-based, global-capitalist, neoliberalism since the 1980s. Economically that led directly to the 2008 financial crisis, and culturally to our current moral malaise, as the 20th-century's historically unprecedented experiment of trying to base a society on the total negation of solidarity has progressed to its inevitable failure. While demagogic and riddled with its own internal contradictions, Bernie Sanders' bizarre presidential campaign has accomplished one important thing. It has reminded us that it not only doesn't have to be this way, but that as recently as 50 years ago it was't this way. There once existed - and still exists if only we were willing to employ it - an alternative moral language not totally dependent on the values of individual liberty, unrestrained freedom, and self-created personal identity. Writing in Commonweal yesterday, Peter Annett suggested that Sanders' appeal lay precisely in this fact - that "he spoke an older, barely remembered language ... describing a fundamental moral failure that could be fixed only with a fundamental shift in values and norms" (cf. https://www.commonwealmagazine.org/how-did-we-get-here). Which brings me back to Hamilton and Aristotle and aristocratic government by "the well born and the able." 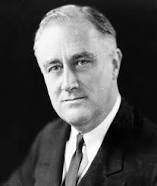 When we hanker for the (admittedly imperfect) social solidarity of the New Deal and post war eras, are we also hankering in a sense for government by the likes of a Roosevelt, a Rockefeller, or a Kennedy? Granted that aristocracy inevitably degenerates into oligarchy and that Roosevelt, Rockefeller, and Kennedy lived at a time when our society was on the verge of an even more pernicious cultural degeneration - that of aristocracy into celebrity - still we look back on such figures as authentic (by American standards) "aristocrats," whose wealth, social position, and education (and their freedom from the experience of having to acquire their wealth themselves) insulated them from the oligarchical impulse to seek to govern primarily in the interest of the rich and freed them to embrace social solidarity as a serious governing value.